I'm a pretty good decoupager. But sometimes it just doesn't turn out like I want. 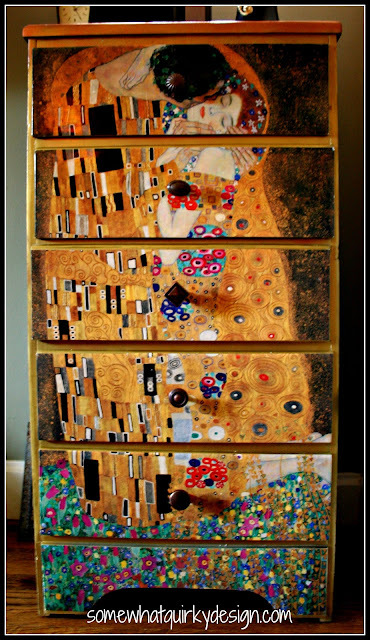 Like this piece of furniture I made a LONG time ago. And I loved decoupaging these suitcases because it was on purpose messy decoupage. 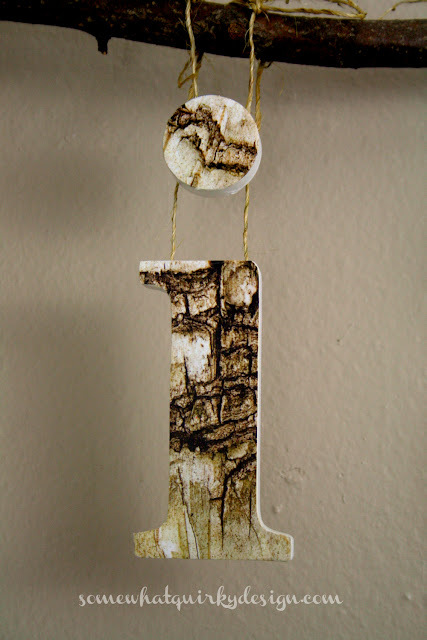 I find that the success of any decoupage project depends on using the best technique for the particular product you are using. To make this project I used 6 letters, all different surfaces, and 5 different types of paper or fabric to cover the letters. I kind of had to use a different technique on each letter. 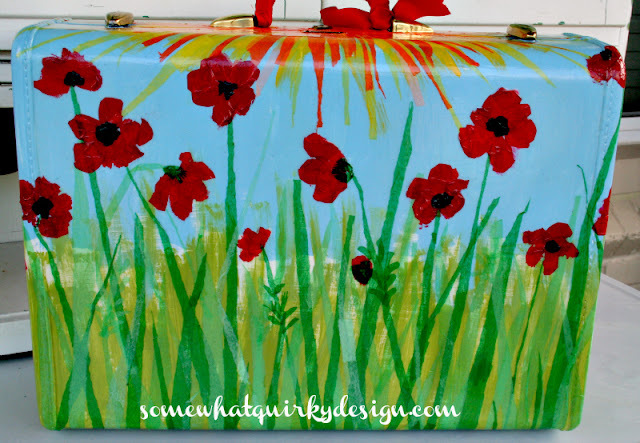 I learned a few things so I thought I would share my great decoupage wisdom with you. 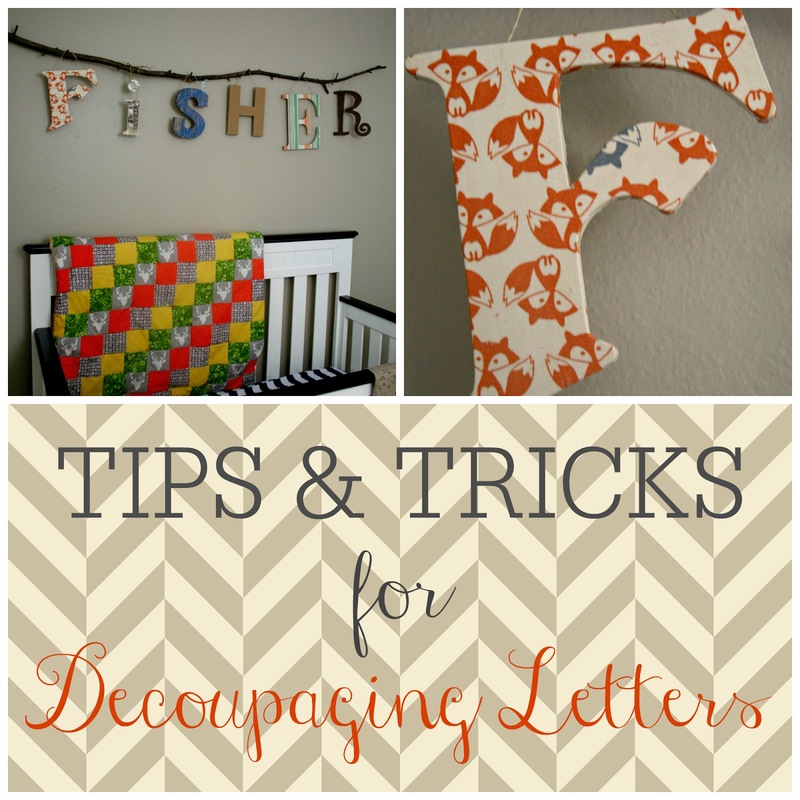 These tips would actually work for anything - not just letters. I think. 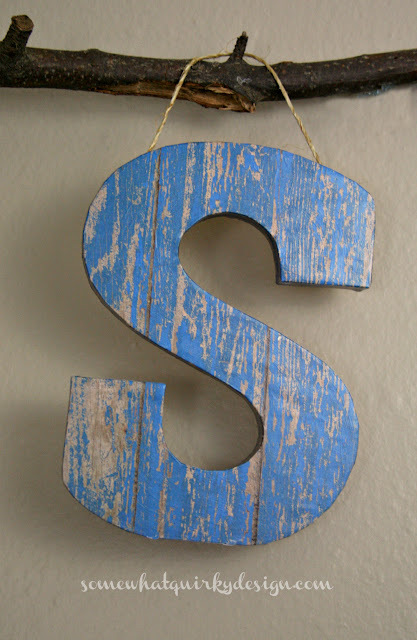 If possible, apply the ModPodge or decoupage medium to the letter (or whatever) and not the paper. Lay the letters face down to dry - but make sure there aren't any blobs of decoupage medium on the front of your letter. 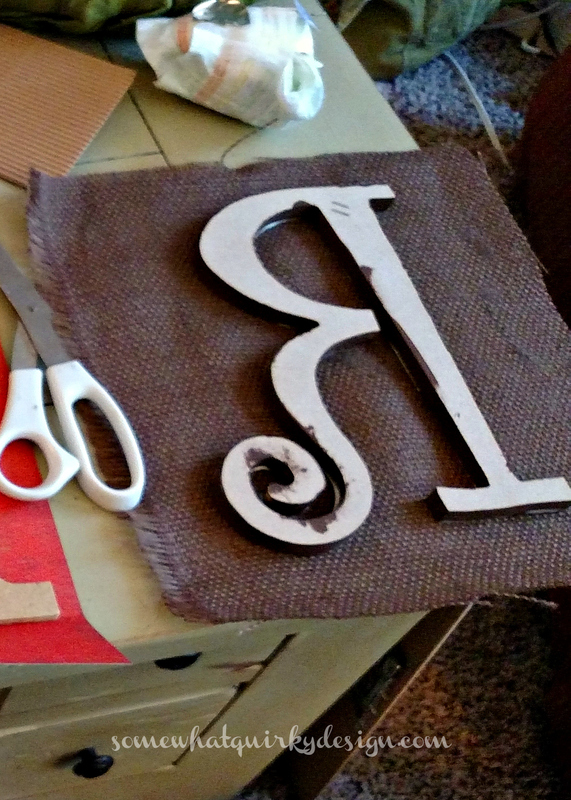 Cut the paper/fabric to the approximate shape of your letter. 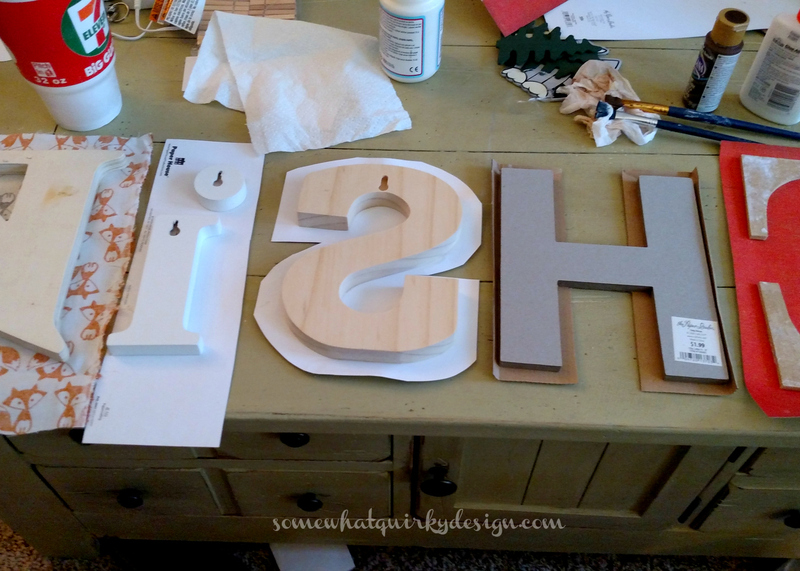 Think in advance if you are going to cover the sides and if your paper/fabric needs to extend to the back of the letter. This way you know how much extra to allow. Let the glue on the front completely dry before you do anything else. Working with wet paper is particularly perilous. Cut all corners and curves so that paper will not tear as you pull it around the edges to avoid tearing. Use a very sharp razor blade or Exacto blade. I used three razor blades on the 6 letters. Once the blade starts to become even slightly dull it can tear your paper/fabric. 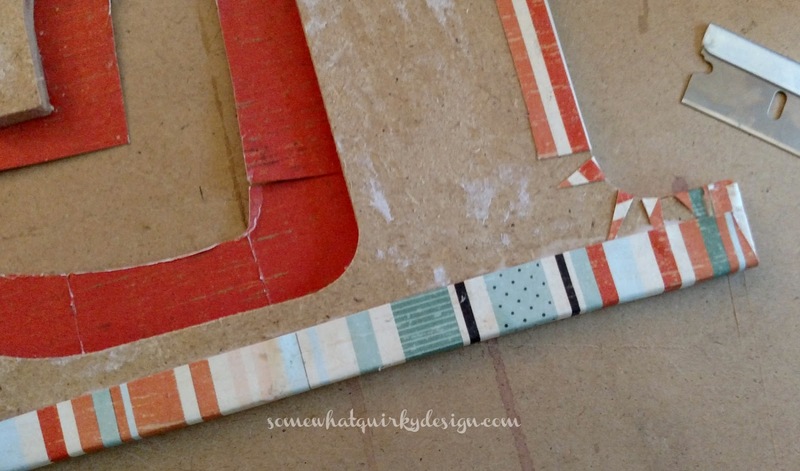 Inside curves will leave gaps on the side of your letter so you might need to cover the side of the letter with a strip of paper/fabric to cover the gaps. 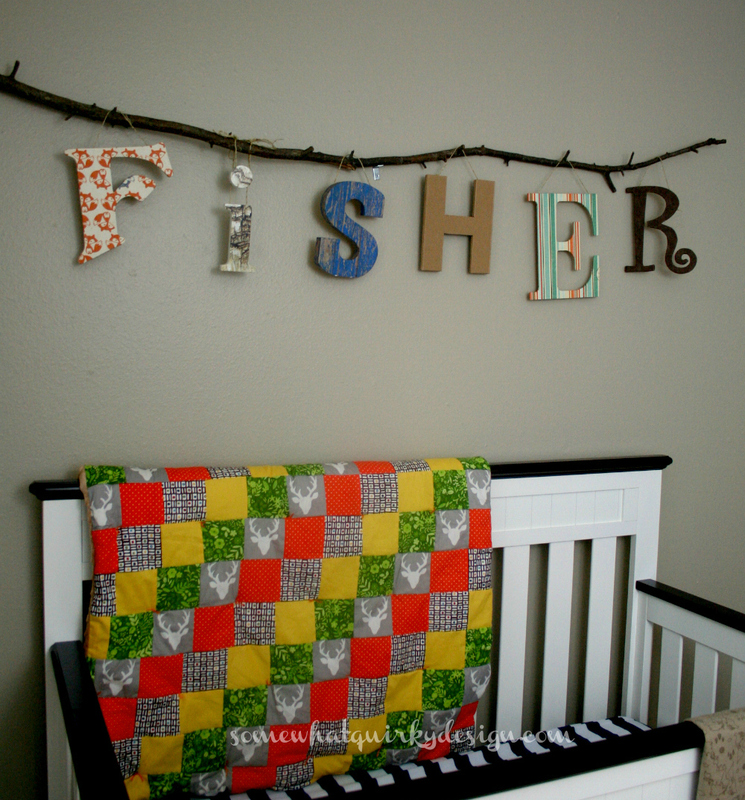 Outside curves will leave overlaps of paper or fabric which may be bulky and messy. 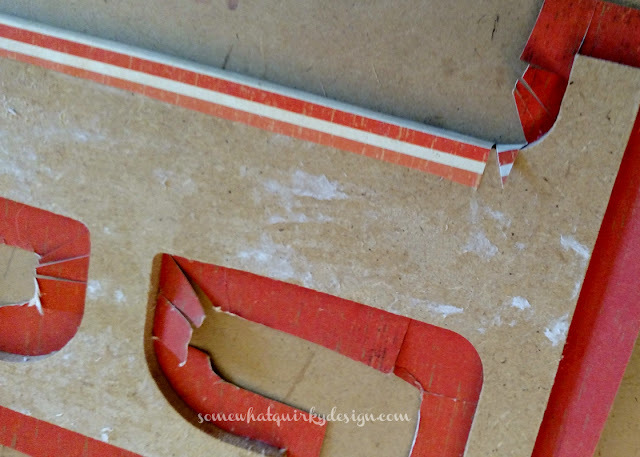 It is a good idea to cut "v" shaped slits so that when the paper is wrapped around you don't have a bunch of extra paper/fabric. yes, that is a dirty diaper in the corner of this picture! we were hanging out with a 4 day old baby. what do you expect?! In general, when I work with burlap or another fabric that unravels easily, I like to apply a coat of decoupage medium to the fabric and let it dry completely before I work with it. For this letter R, with all the curves, etc. it would have been easier if I had NOT made the fabric stiff first. It made it difficult to get the edged glued - I believe it would have been easier to have soft fabric to work with as I glued it to the back. 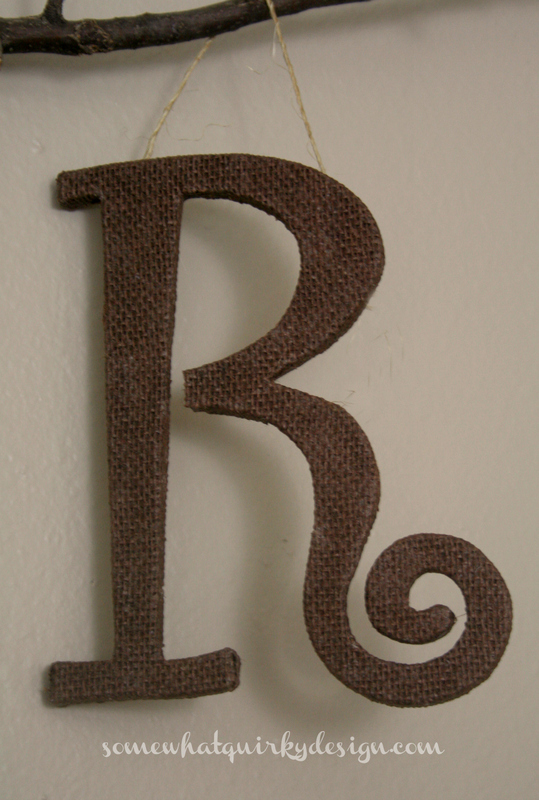 When working with fabric like burlap, it is best to use letters with straighter edges. My take-away from working with the burlap issues and then NOT pre-treating the fox fabric (left) before gluing sides and back, is this: If you are working with flat object - table top, drawer-front - with long straight lines, pre-treat your fabric. It will be easier to get a straight, fray-free cut. If working with 3-d surfaces, do not pre-treat your fabric. 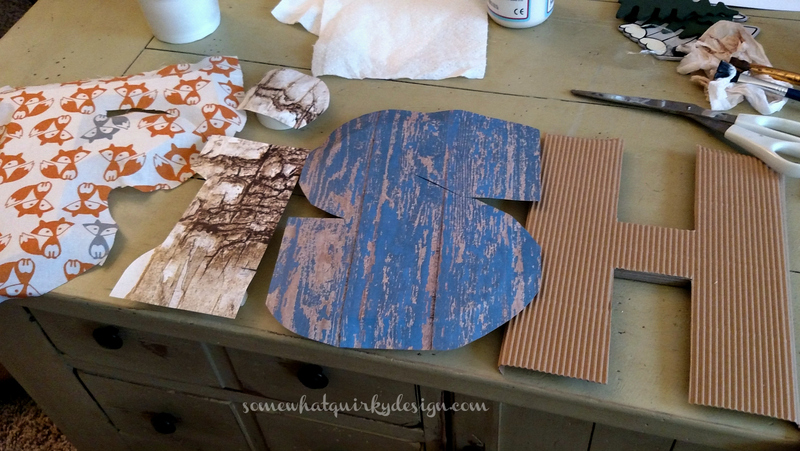 When covering items with burlap, you need to paint the piece that goes underneath to match. You WILL be able to see the surface color through the burlap. 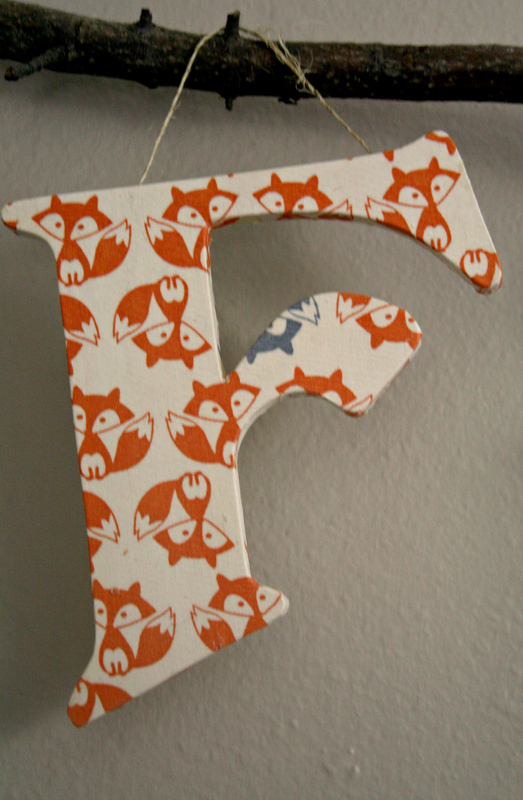 When using a print fabric, you can cut small pieces to fill in the gaps left on the inside curves of the letter. When working with very thick paper like this corrugated paper on the H, it would be best to just paint the sides of the letter to match and cut the paper to fit with a blade after it has been glued to the front of the letter. Because these edges were straight, I pulled it around the edges, but if I were doing it again I would not. If you did it that way it would work well even with curves. 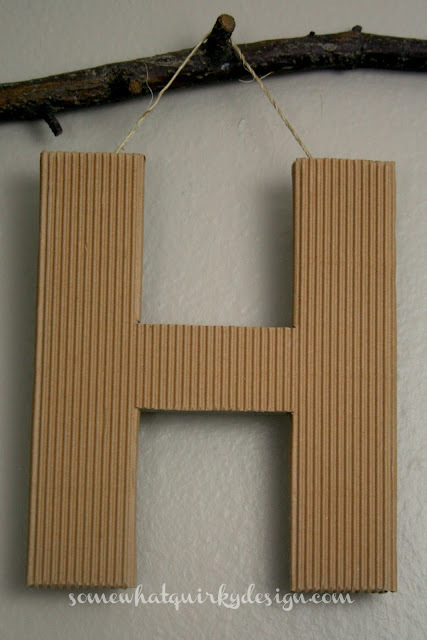 When your letter is pre-finished like this "i" it is also a good candidate for just trimming the edges at the top and not wrapping the paper or fabric around the edges. When your letter is thick, like this S, you will need to cover the gaps on the side. I cut a strip of paper the thickness of the letter and then decoupaged it to the side of the letter. When the letter is less deep - like the E above - you don't need to worry about covering the gaps made in the curves. You DO have to worry about the overlaps at the corners though. Be sure to cut out the surplus at the tip of the corner. 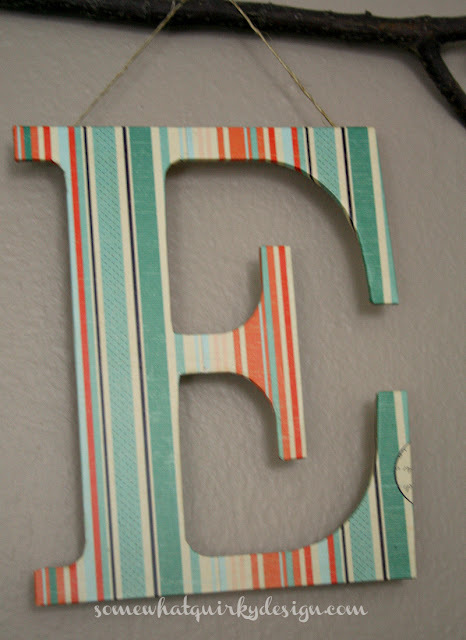 After you have finished all the edges and cutting, THEN you apply the decoupage medium to the top and sides of the letter. 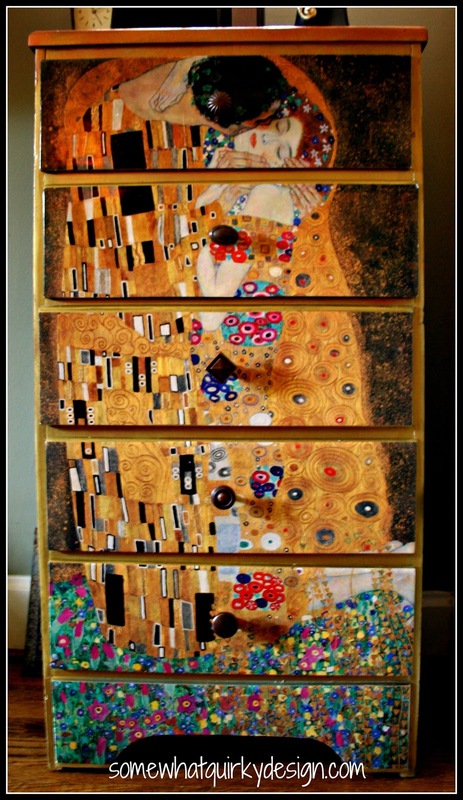 Decoupage medium is available in many different finishes, satin, flat, gloss, outdoor, heavy duty, etc. Pick the best one for your needs. Absolutely DO NOT stack letters on top of each other - they will stick together and you will have a mess to fix. I think the whole thing turned out pretty darn cute! Don't you? What are your best decoupaging tips? I would like to eliminate those projects that don't turn out so well . . . I have decoupaged a few items in my life; mostly on wood, and I bow to you as the Decoupage Queen, indeed. That is alot of decoupaging!!! and it all looks great. I love all the tips you gave us and I'm bookmarking this page as a tutorial to go back to for my next project. When I realized how expensive Mod Podge was getting, I simply went back to white glue and water and it has worked well in each and every project, so far. What are your thoughts on this and have you ever used it? I am pinning this to help me when I finally get around to decorating the letters I have. I am in love with the letters. I have never decoupaged anything...ever...so seeing this was quite a treat. This turned out SO CUTE! I love the branch for hanging it on... thumbs up to you gramma! Oh my question is answered - congratulations Karen !! !